Editors make books better. Some authors will tell you editors or the editing process are a huge pain, but it doesn’t have to be that way. When you are finding the right editor, you should find someone who makes significant improvements to your book. If you are just learning how to self-publish a book, you may know that you have way more control and responsibility to find an amazing editor for your book. There are several types of editing, but each one is a key player in taking a book from messy draft to polished and published. Developmental editors make the story better. Line editors make the language better. Copy-editors make the grammar better. And proofreaders make the small details better. If you don’t know the difference in these types of editing services, check out this review of types of editing. 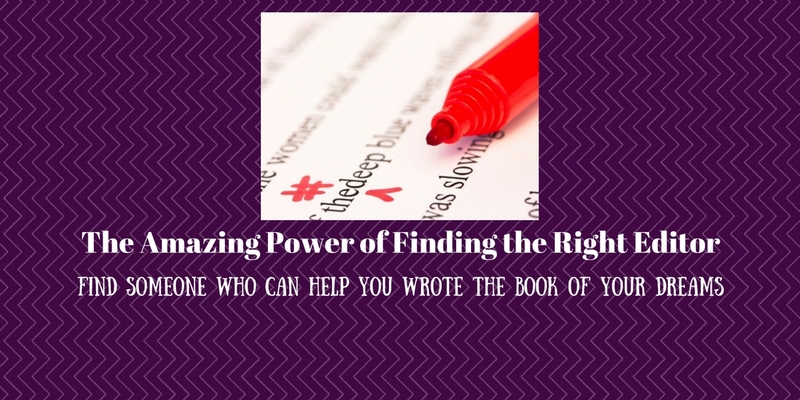 Finding the right editor, or even editors, can have a dramatic effect on your book. Therefore, it’s crucial you know what to look for in editing services before selecting an editor. Choosing an editor is definitely not the time to go with the first person you find or the one with the cheapest rate. Otherwise the whole process might end up being a huge headache or waste of money. So I’ve put together for you the six most important things to look for in order when finding the right editor who can help you write the book of your dreams. Many editors won’t pick a genre for fear of missing out on potential clients. As authors, though, don’t you want someone with professional and leisure experience in your genre? This way the editor knows what readers expect. Editors with experience in your genre know what keeps a reader from putting the book down, and can help make your book one of those can’t-put-down books. Many editors who’ve worked with well-known authors come with a hefty price tag. You may not have the pocketbook for the most expensive editor, but you probably don’t want to skimp and get the cheapest either. Somewhere in the middle are those who are more affordable and great at refining books. Here are the suggested minimum rates from sfep. Some editors will post a rate per word on their website, which you can easily calculate an estimate yourself. But many editors use an hourly rate, which is almost impossible for authors to predict. In this case, your best bet is to send the editor a portion of your book, ask for a sample edit (so you can see their work) and get a quote. Do this with a few editors then compare the work received and the cost. With self-publishing and freelance editors online, language is an important thing to clarify with potential editors before getting into a contract. If you’re writing in English, find an editor who speaks English as their first language; get even more specific and clarify if it’s UK English or American English. Most people know spelling varies (e.g., favorite vs favourite), but did you know there are lots of other grammar rules that vary as well? Quotation marks and punctuation are big ones. Even words like spelt and spelled differ. There are SO many editors to choose from out there. Do yourself (and your book and your readers) a favour and choose an editor who’s fluent in your book’s primary language. Testimonies are a solid start, but references are better. Ask an editor for references then send them an email or message on social media. You could ask about their experience working with the editor, if deadlines were met, if the final cost was as quoted, how the editor improved the book, and if they have or would work with the editor again. You definitely want an editor who comes with recommendations. This helps assure you are not the editor’s first book and the editor is good at writing and revising. Are you looking for someone who will take your book, edit it, and send it back? Or are you looking for someone who will walk you through the steps and consult with you about changes and recommendations? Most editors know how much communication and involvement they tend to use when they work, so if you have a strong preference one way or another, discuss this with potential editors upfront to see if it’s a good fit. An editor and author are a team with the goal of making a book the best it can be. It’s essential that you work well together. Pay attention to the vibe you get from the editor no matter if you’re communicating through email, Skype, or social media. If you don’t like the way the editor communicates with you, keep searching. There is a lot of communication back and forth between an editor throughout the process of revising a book, and editing is one of (if not the) hardest part, so make sure you find an editor who you can get along with. If you consider all six of these things, you will be well on your way to finding the right editor who can use their story, language, and grammar power to make your book its best.